Limited production, exquisite fit and finish, and usability, too: how much more does it take to qualify a camera as a classic, or a collectible? Maybe a good dash of eccentricity; and the NPC 195 qualifies on all counts. The fortunes of NPC (Newton Plastics Corporation) rose and fell with those of Polaroid. They were probably best known to most photographers for their Polaroid proofing backs using the late Marty Forscher’s patents for optical-fiber transfer of the image, though they also made a superb tripod head of unique design (the Pro-Head), a microscope camera, and more. They did a lot of government work, including for NASA, but a few years ago, after decades of success, they closed their doors. Polaroid was not the first company to try instant photography. Back in the daguerreotype and wet plate days, patents were granted for cameras in which the plate could be developed inside the body. But it wasn’t until 1864 that the first commercially successful instant picture camera came to the market. When Leitz launched the Leica in 1925, they did more than start the 35mm revolution. They also influenced the way some rollfilm manufacturers began to consider smaller formats. One result was small rollfilm cameras that took their own unique sizes of extra-small film. The Ensign Midget was one of the best. It’s a dream specification. Top-flight construction; about the same weight and bulk as a professional D-SLR, though rather more convenient in shape; interchangeable lenses; camera movements; choice of ground-glass or viewfinder viewing; and a great big juicy 6x9cm format. It’s finished in beautiful Morocco-grain leather and the controls and fittings are in nickel and black-lacquered brass. It certainly sounds both desirable and usable. When it was launched in 1956, advertisements of the time claimed the Rittreck to be the world’s most versatile Single Lens Reflex (SLR). It’s a statement that would be difficult to argue with. How many other SLRs can you name that offered interchangeable lenses, interchangeable backs, close-up facilities, a choice of four different formats, and the option of shooting on roll film or cut film? Those who read Popular Photography magazine in the years from 1972 to 1987 will be familiar with the name and with part of the work of Norman Goldberg, who was its technical director over that period. They and others may also know his book Camera Technology: The Dark Side of the Lens (Academic Press, 1992). Long before the Mind of Minolta popularized autofocus SLRs with the introduction of the Maxxum 7000 there was the XD. In the days before digital, most film cameras had built-in, battery-driven motor drives. But cameras with motor drives were around long before the electronic age, the only difference being that they ran by clockwork. A while back I had picked my top 20 cameras of all time, a topic that still draws comment on the Shutterbug Forums. While few Shutterbug readers venomously assailed my choices or impugned my historical accuracy, practically everyone posting on The Top 20 Cameras of All Time Forum was rooting for their favorite cameras, or complaining that their gems weren’t included. In 1947, the English Wray Optical Company took out a patent on an amazing and innovative 35mm Single Lens Reflex (SLR). 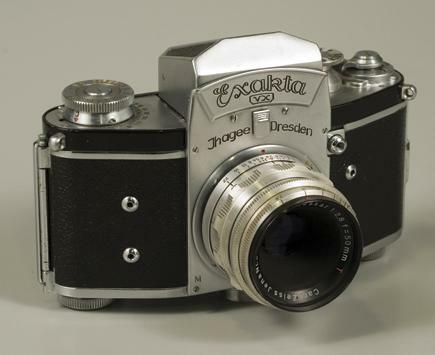 It had an eye-level penta-prism viewfinder, instant return mirror, Through The Lens (TTL) metering, and a built-in clockwork motor drive—four features never before seen on this type of camera. The inside joke at Minolta was that the “CL” in Leica CL stood for “Cheap Leica.” Surely owners of Leica M4s and M5s felt the same way—even though it wasn’t true. The 31st Used Camera Show 2009 took place for six days earlier this year at the Exhibition Floor of the Matsuya department store, Ginza, Tokyo. Never before have I bought a camera on the strength of its lens cap, but I could not resist the magnificently moustachio’d Gaul on the lens cap of the Gallus Derby Lux.